The first Tuesday after Thanksgiving is called “Giving Tuesday.” How fitting is it that I premier my 12 Days of Service starting on Giving Tuesday!? Why 12 days? Well, it’s a play on the 12 days of Christmas where instead of getting gifts we give gifts of service. You don’t have to serve on a soup line, or build a house to give back to your community. For the next 12 days I will share suggestions for easy yet effective ways to volunteer your time. Volunteering has always had a special place in my life. My mother used to take me along with her to volunteer when I was a kid. As a teenager I was a candy stripe at our hospital and served meals in our local soup kitchen. I love the instant gratification of putting a smile on someone’s face. As a mom I want to give my kids the gift of volunteerism. But, the logistics of getting all three of us out of the house and onto the soup line is just too much. So, I found ways to volunteer with my kids without leaving home. Our very first service project together was collecting canned goods for our local food pantry. For the twins second birthday party we asked guests to help us collect items. On our invitations we offered suggestions for donation. At the party we put out a box to collect all of the items in. Having party goers bring their donations to our house was easier than trying to collect from several different locations. At the end of the party my kids helped me bag up the items and deliver to the collection basket at our church. Even though my kids were just turning two it was a super easy way for them to get involved. 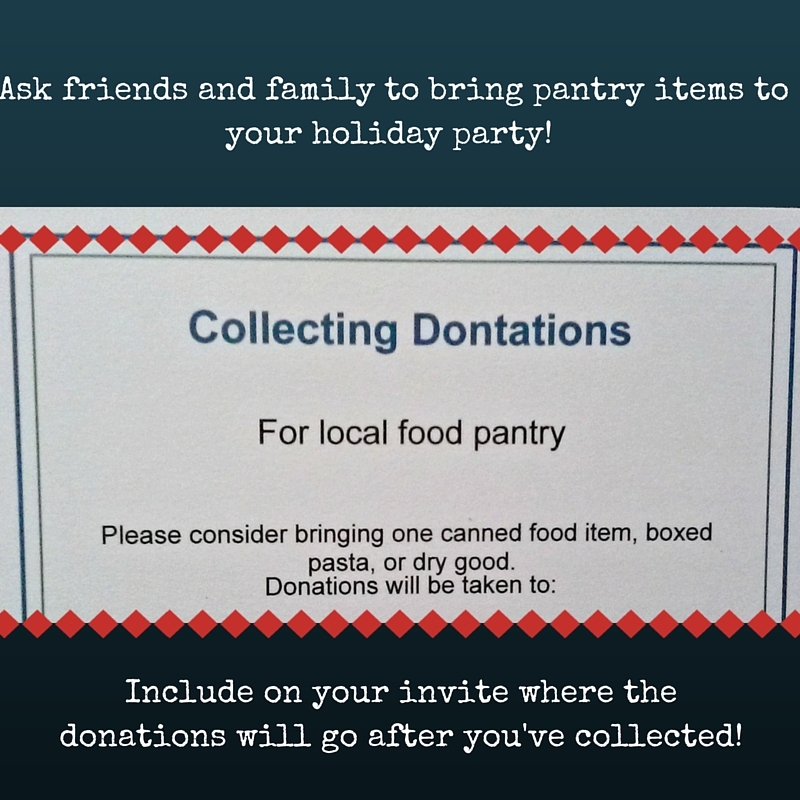 With all the holiday gatherings coming up why not ask each of your friends and family to bring along a contribution of one canned good, or a box of pasta? Find out where your local food pantry is located and call or email to ask for what their biggest need is right now. Your kids can help make the final delivery and see the pantry in action. If you are strapped for extras this year because of holiday spending, food pantries are always in need. People tend to be very generous during the Christmas season; while donations tend to dry up the rest of the year (about 40% of food pantry annual donations are received around Christmas time). If you can’t swing it this holiday, why not host a Souper Bowl party asking for canned soups during the big game, or ask for food donations in July (and then you can call it Christmas in July!). You do whatever works for you and your family and enjoy getting the kids involved! Kids of any age can help collect food items, sort and deliver. It’s never too early to help kids learn to give back! It is so sad to me how many people are food insecure. My area has a food bank and our co-op donates to that regularly. I think this is a great idea, especially at this time of year! Such a great idea. I plan on doing plenty of community service this month! I think giving is such an important part of the holidays! This is such a great way to give back too, and so easy for the whole family too! 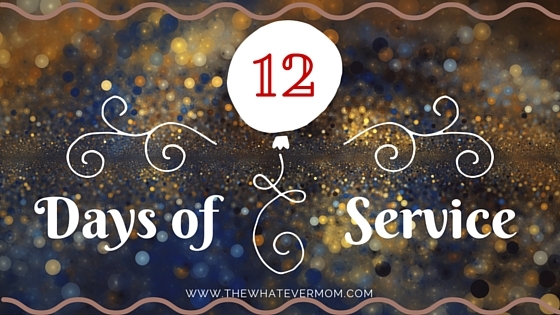 I love this “12 Days of Service.” My church is doing something very similar over the next few weeks. I love this season of giving and your food drive is a wonderful way to serve and help others! Teaching your kids to give back is so important! Love this post! I think donating food to the homeless or those who need it is an excellent idea, they go through so much and especially at this time of year when everyone is receiving gifts it is important to help them. I live the idea a 12 days of service!!! I need to follow suite!!!! What a great way to give back. Great idea of 12 days of service!!! Great Idea. love that you’re sharing this too. When I was a kid at school in UK we had a “harvest festival” each fall. Basically a food drive. As kids we’d make the food up into baskets and we’d distribute the food to local needy pensioners and families. Not even sure if they still do this, I hope they do! Amazing way to get kids involved. And memorable! I really want to start doing things like this with my boys. I want to teach early that there are always others how need help. I think they would really enjoy it. Good for you! My sons’ pre-school is collecting food for a local food pantry so am having us all collect and donate together. Great to get him involved at such a young age! I am always giving away extra food if we are not going to eat it in time. It’s so important to give back to those who need it. What a wonderful deed you’ve done! I love this series too–it’s always great to promote ways to give back to our community and I love that you’re sharing this on your blog! You rock! Awe thanks! Growing up with so little, it feels so good to be able to give so much. Getting the family involved in service is such a great way to teach kids about kindness and compassion. This year we are donating toys to the Sherif department for kids they come in contact with through unfortunate circumstances. That’s a really great way to help out!! Giving back is so important. You are doing great things.